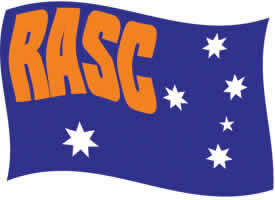 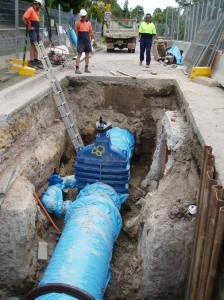 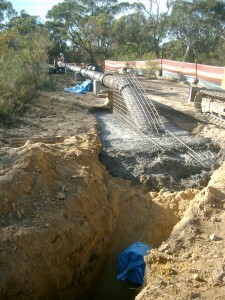 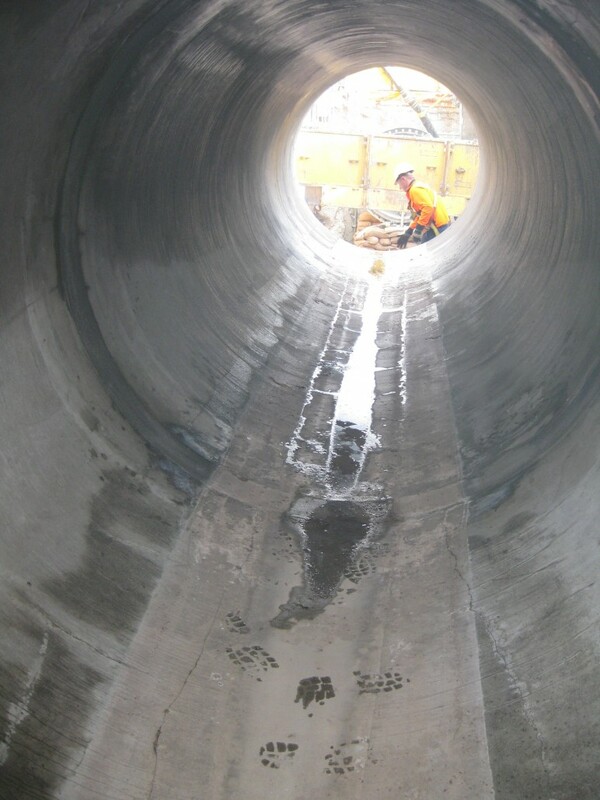 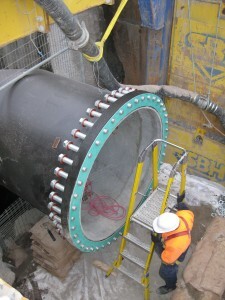 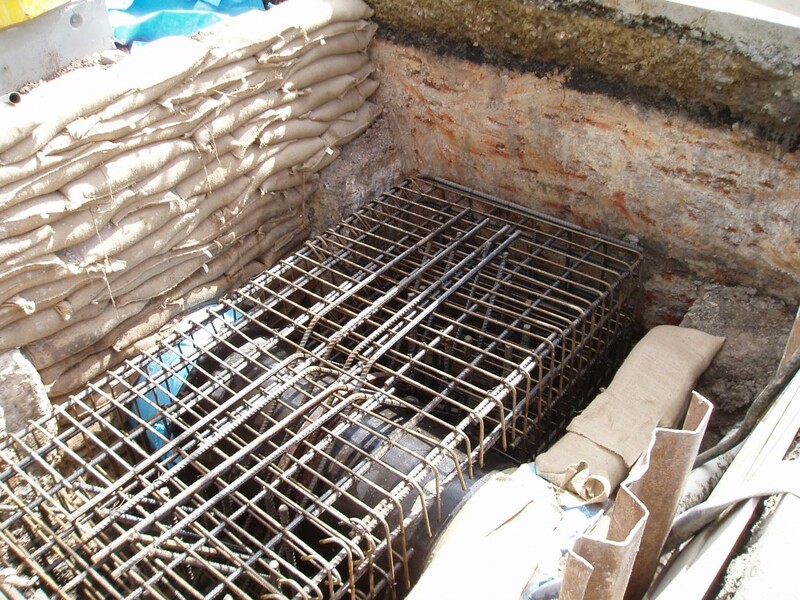 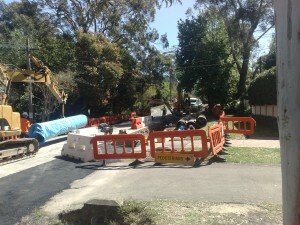 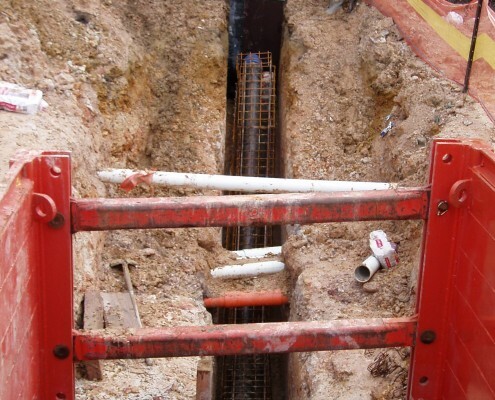 R.A. Smith Contracting are specialists in the installation of watermains and water pipelines. 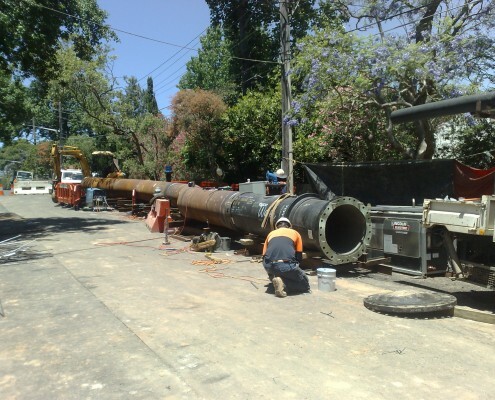 R.A. Smith built it’s reputation on our ability to excavate and lay watermains fast and accurately, from the early days of laying through the Victorian bushland with a bucket-wheel trencher, to today where we lay mains through a mine-field of underground services through residential streets. R.A. Smith are accredited to install potable and recycled watermains for Sydney Water, which are installed to the WSAA Code. 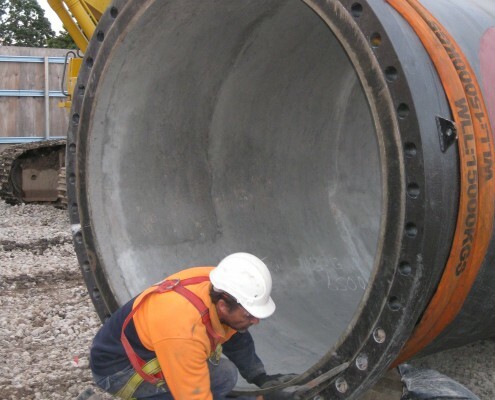 Our team of specialists and sub-contract partners can lay all types of materials from welded ‘sintakote’ steel, DICL, PVC, GRP and Polyethylene. 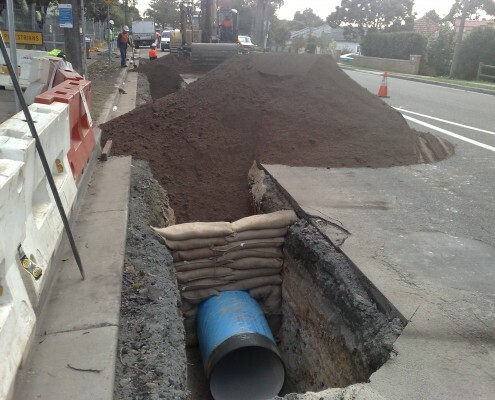 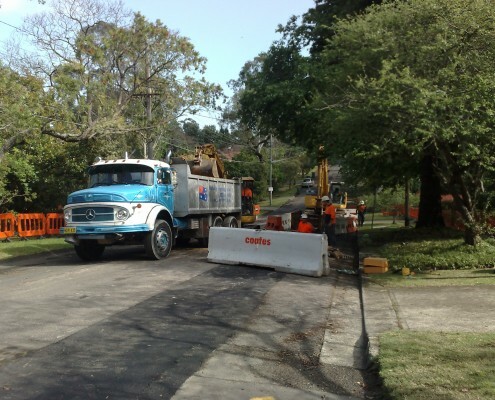 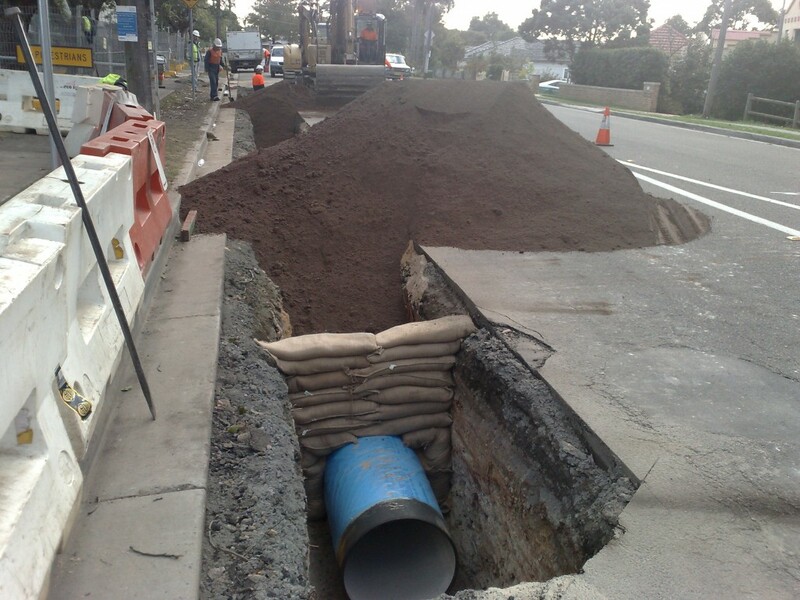 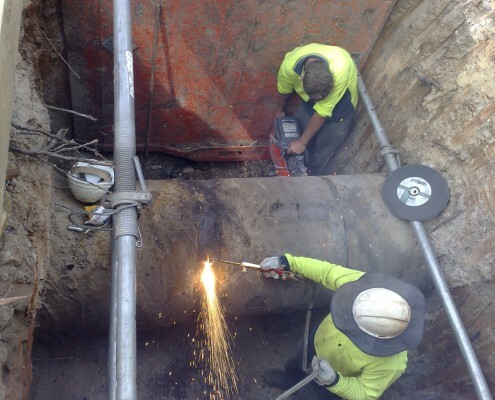 When required, our crews are able to lay watermains outside of the Sydney Water area of operations to Local Authority requirements, which are generally based on the WSAA Codes. 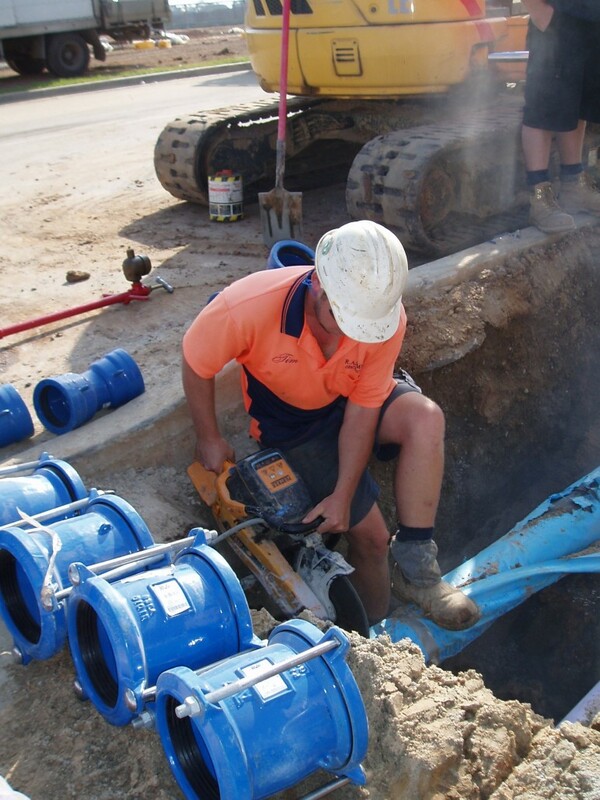 R.A. Smith have Licensed Plumbers that are accredited to install private water services, irrigation lines and fire services to the AS3500 Plumbing Code. 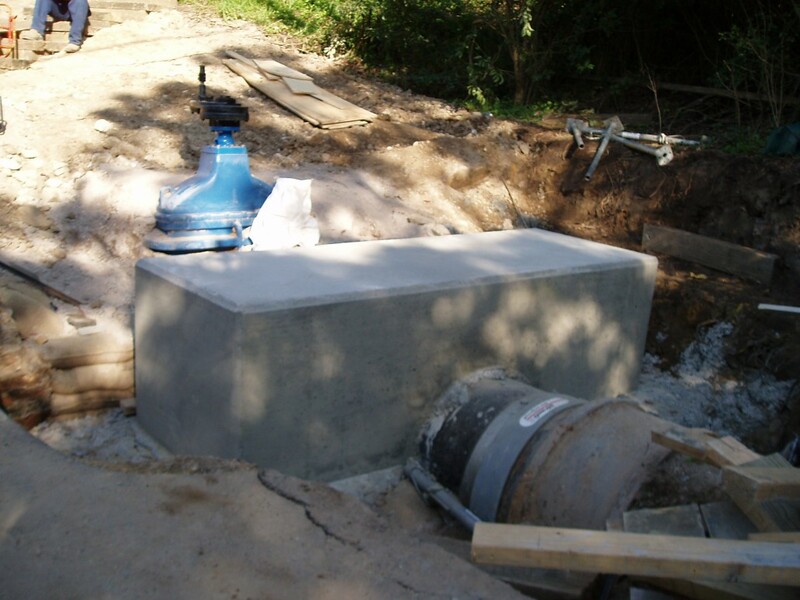 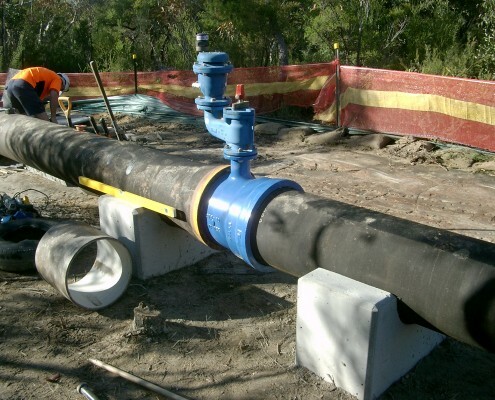 Our scope of expertise ranges from very large mains to small private mains. R.A. Smith Contracting can install watermains for your next housing estate project, in either single water or dual (recycled) water areas. 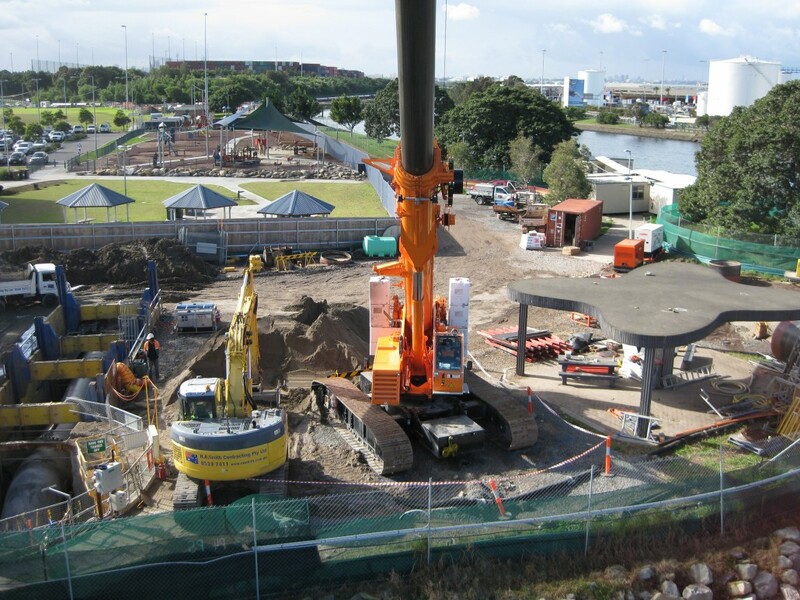 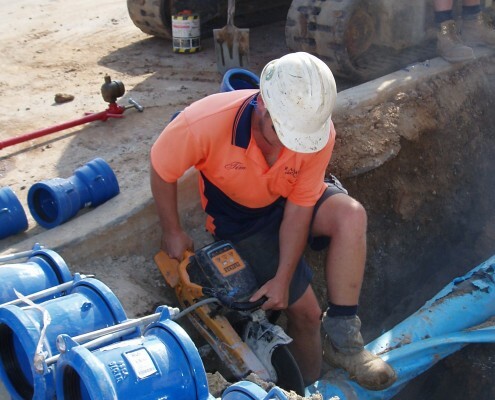 R.A. Smith can help with planning, provide costing’s, undertake installation of mains, property services, meters and backflow prevention devices for housing or industrial estates in Sydney or anywhere on the East Coast of Australia. 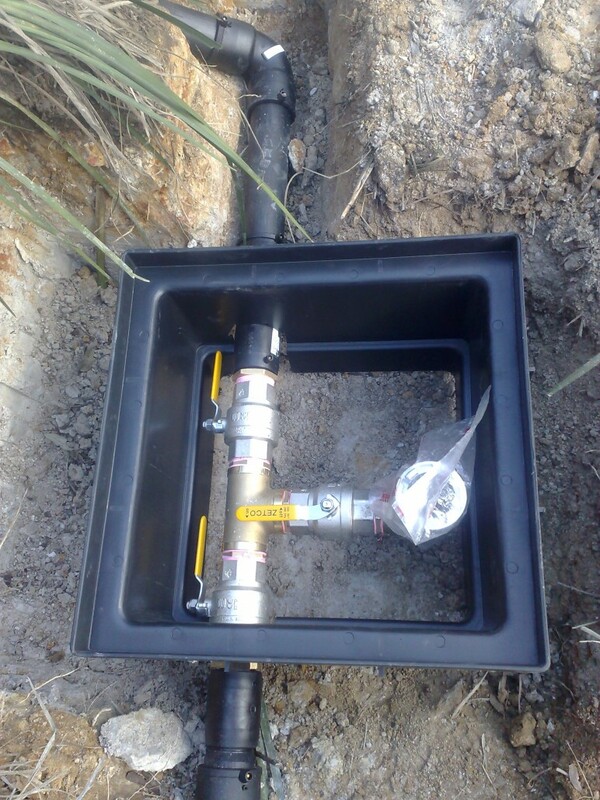 We will install your mains quickly, professionally and provide you with a Quality Assurance package that will satisfy the Water Authority’s requirements for hand over and Certificate issue. 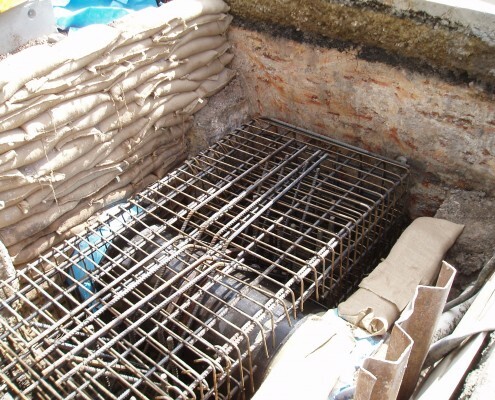 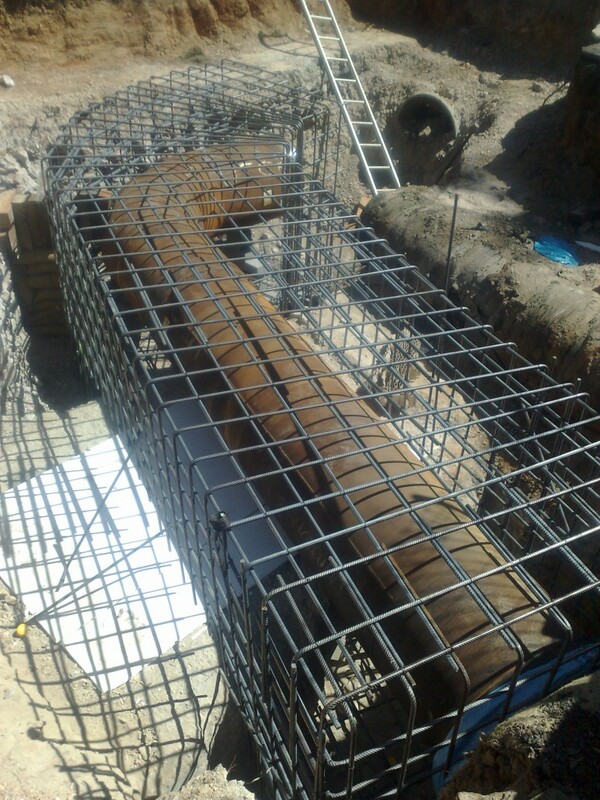 R.A. Smith Contracting are experts at watermain renewals and up sizing including transfer of services and provision of fire tees. 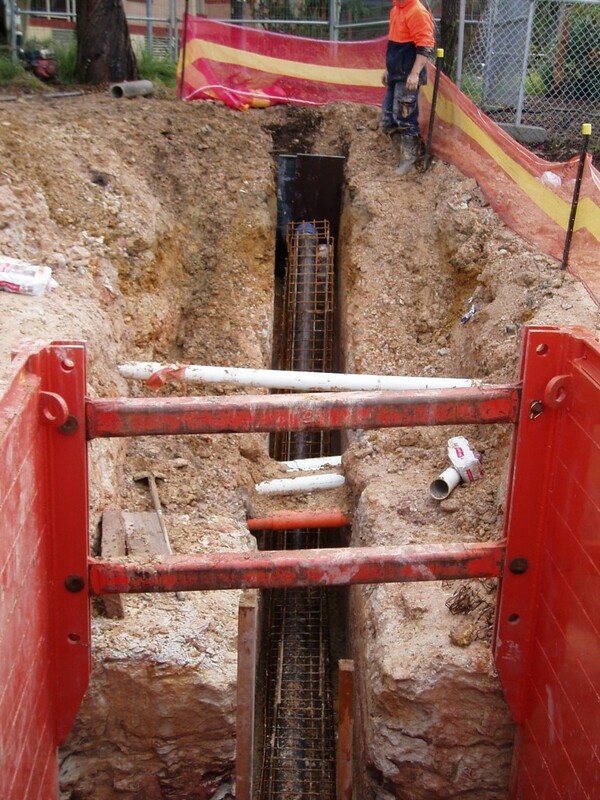 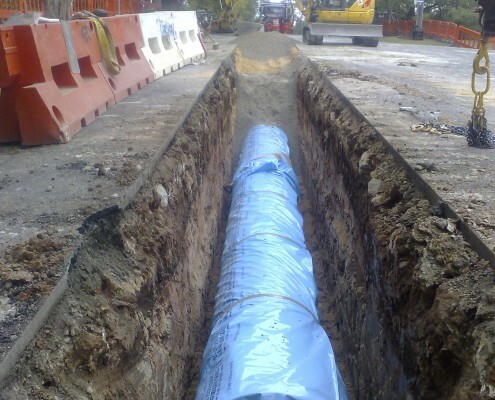 When working in built up areas, our trained staff will minimise impact on the existing built and natural environment using a combination of open cut and trenchless methods. 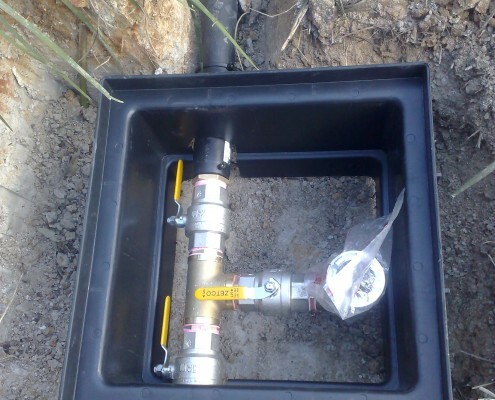 This will ensure that mains are installed cost effectively and with little community impact. 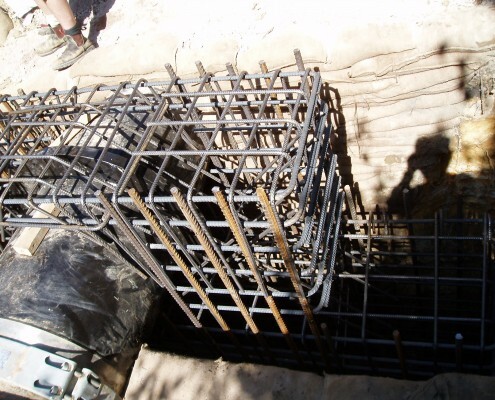 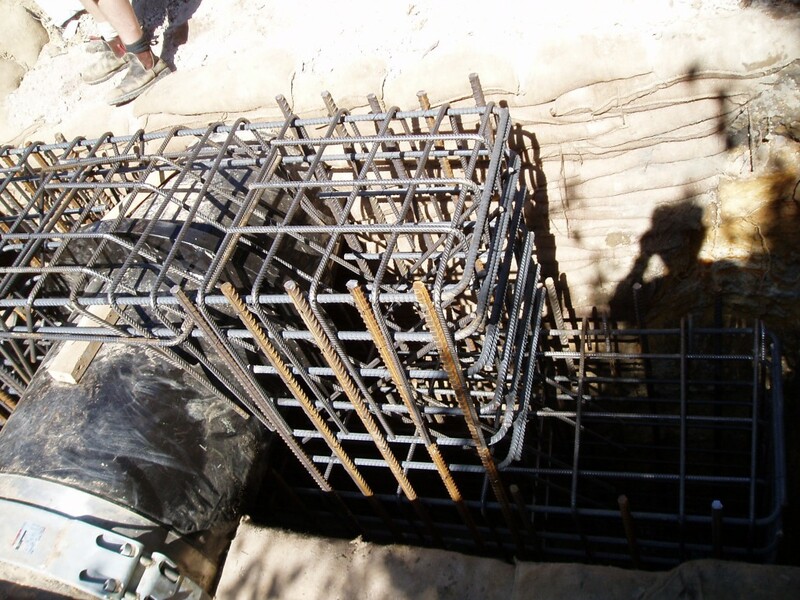 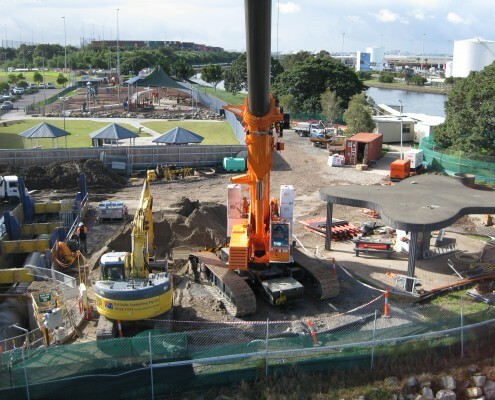 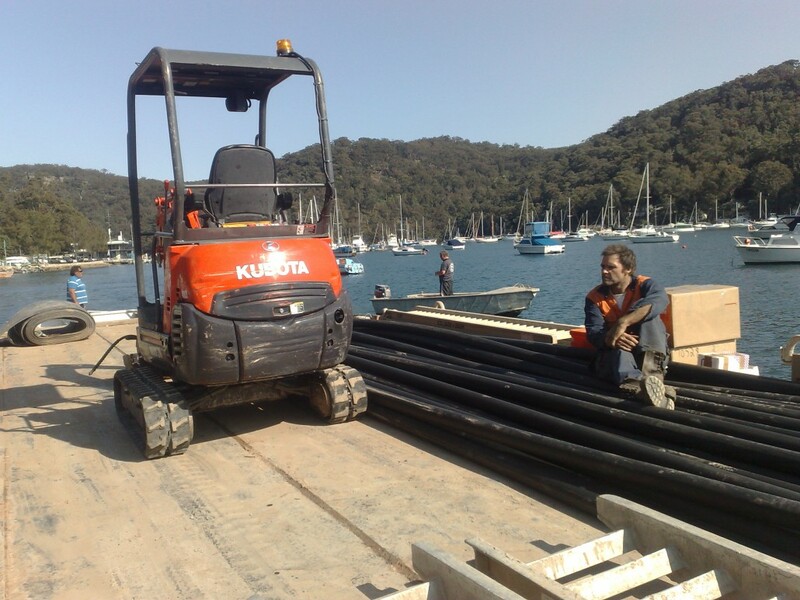 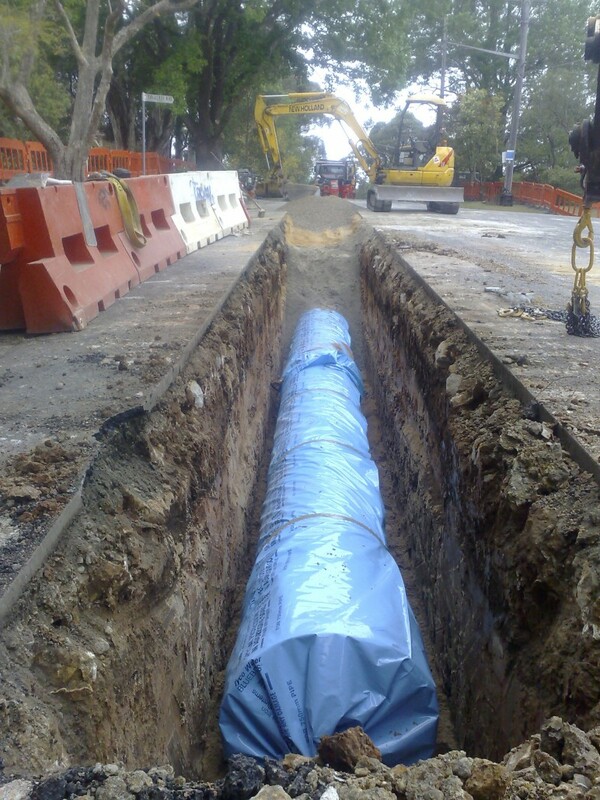 Our specialised trenching, earthmoving and restoration equipment is selected from our wide range of plant to ensure that the project is completed quickly and quietly with a minimum of fuss. 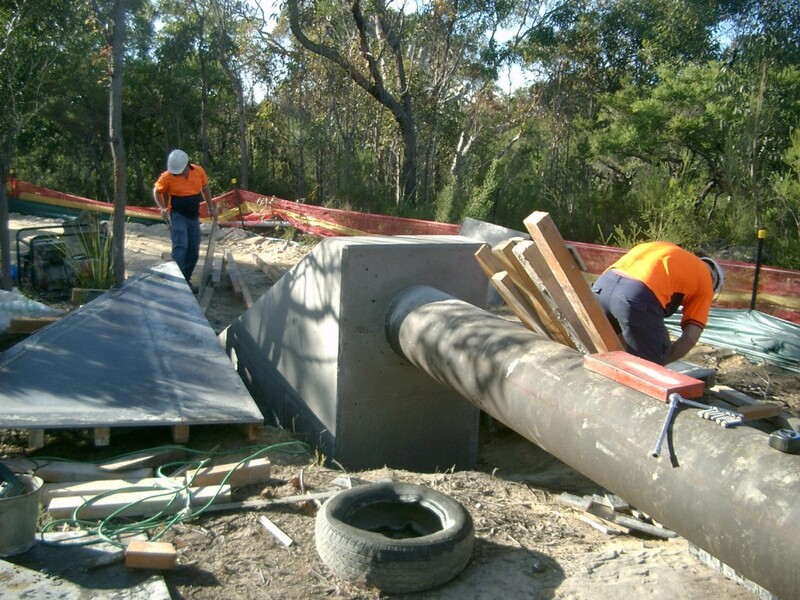 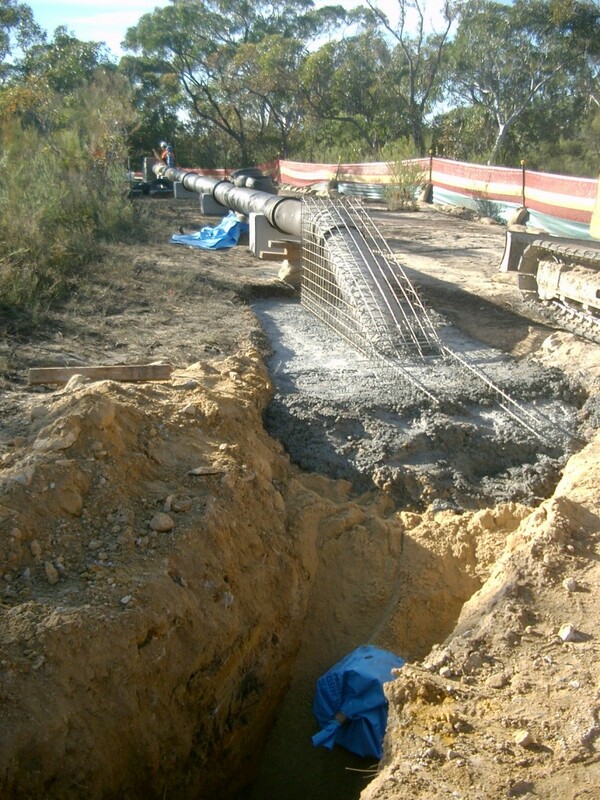 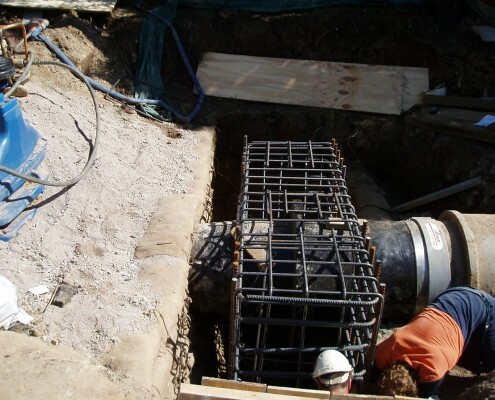 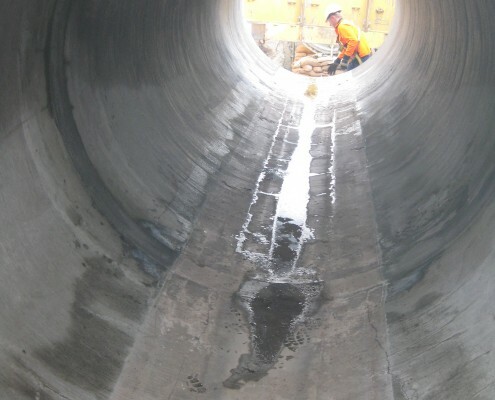 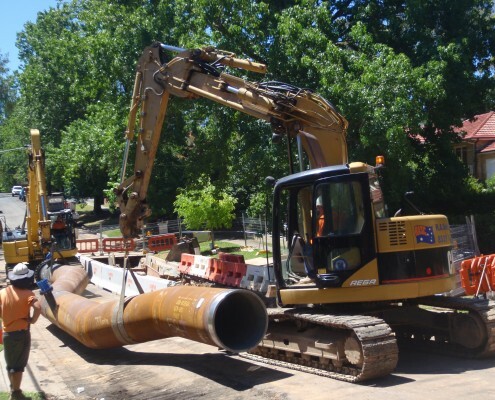 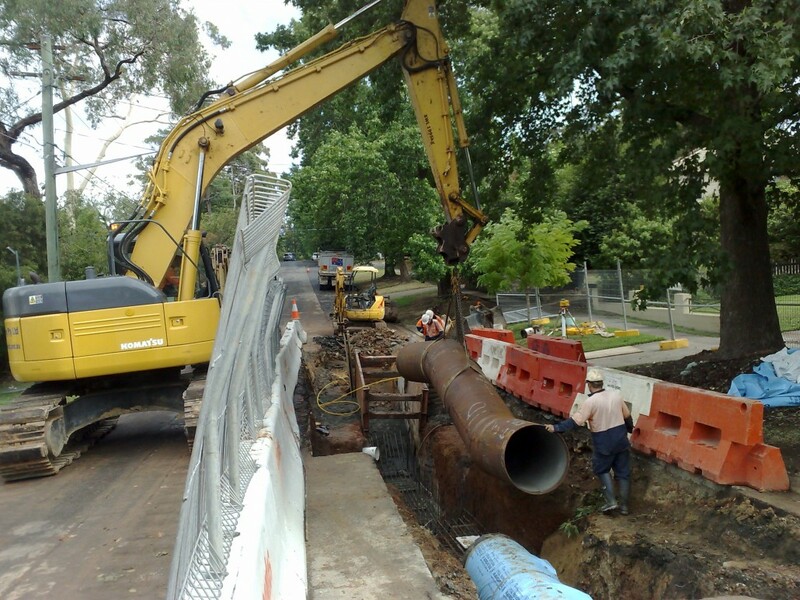 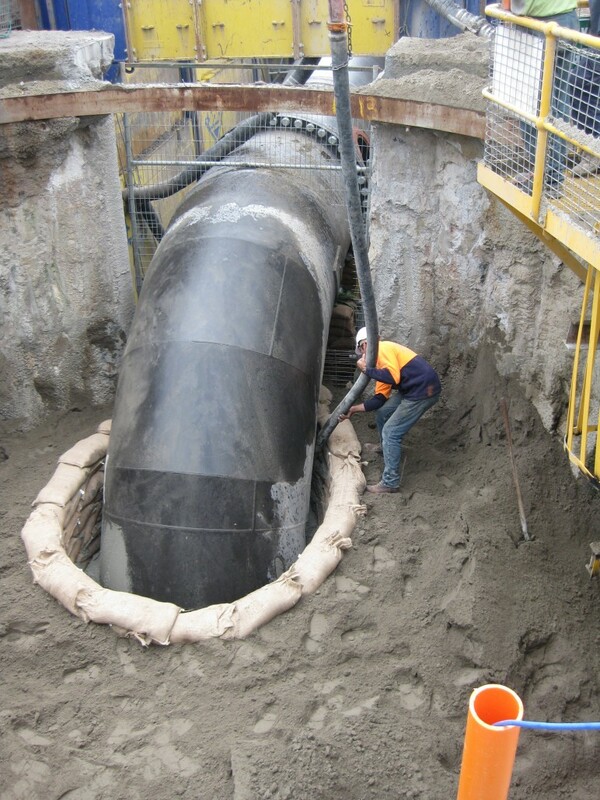 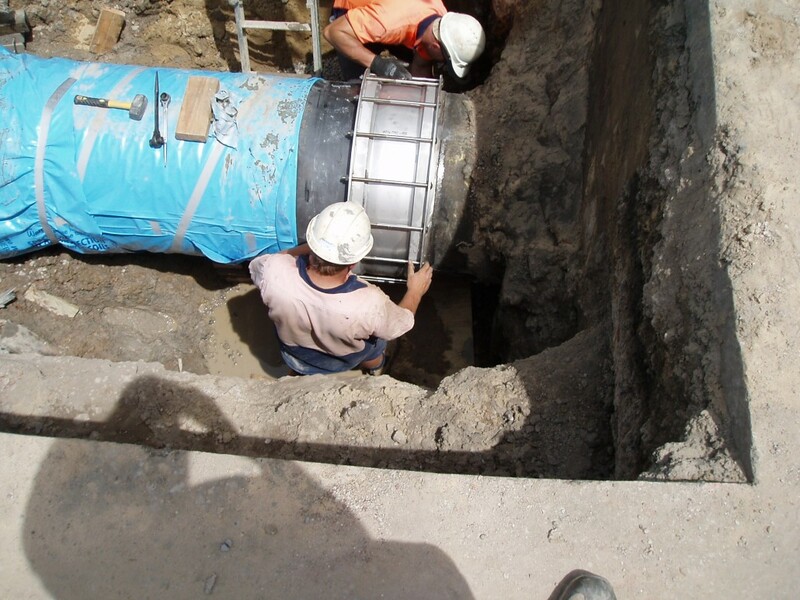 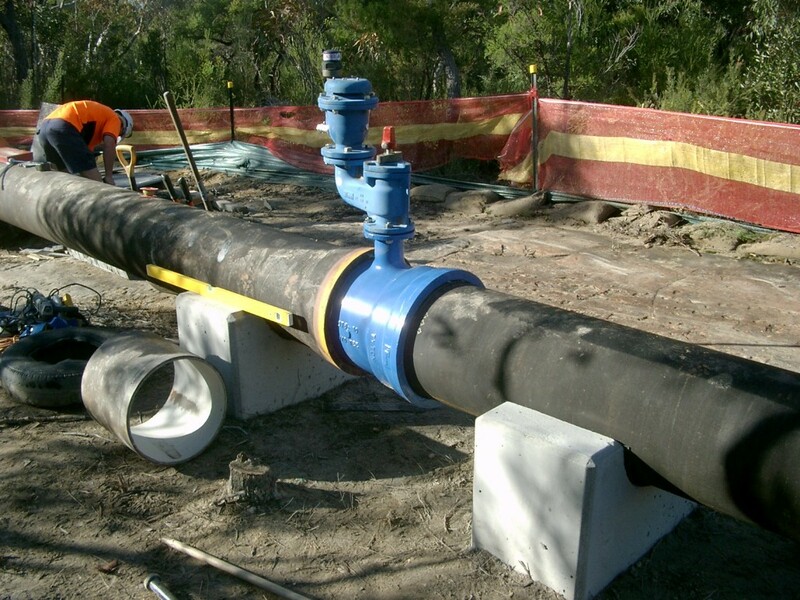 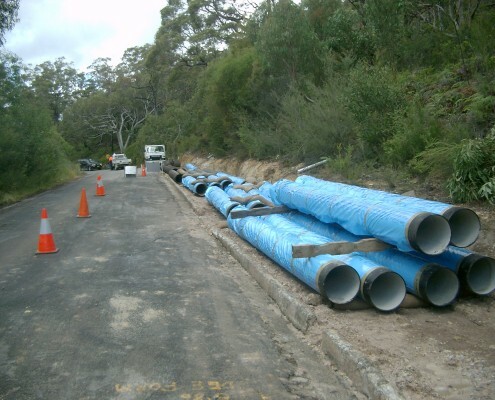 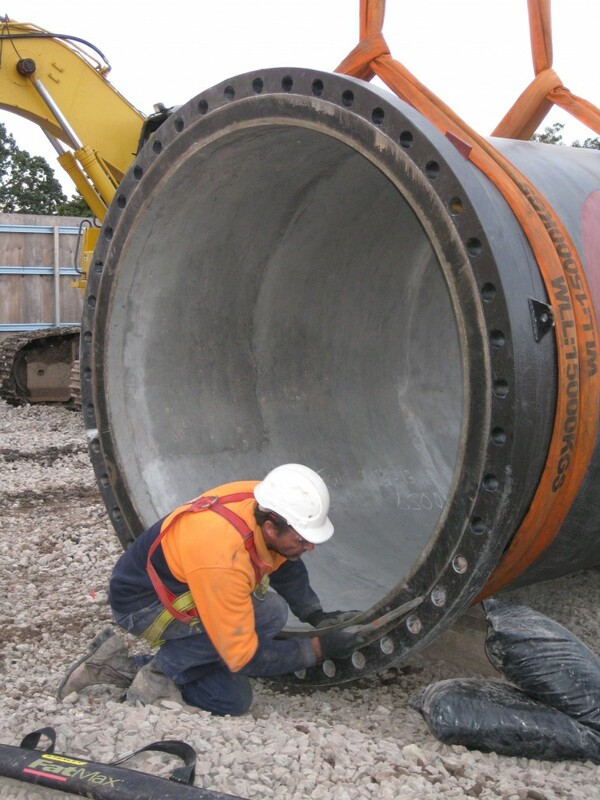 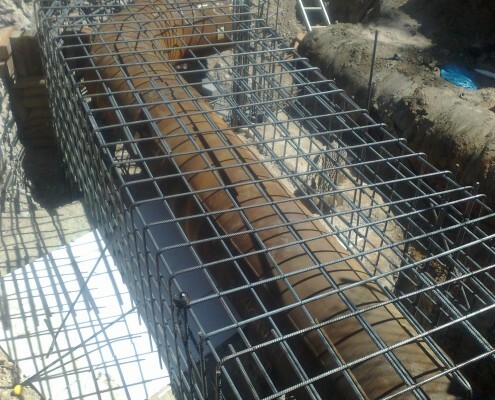 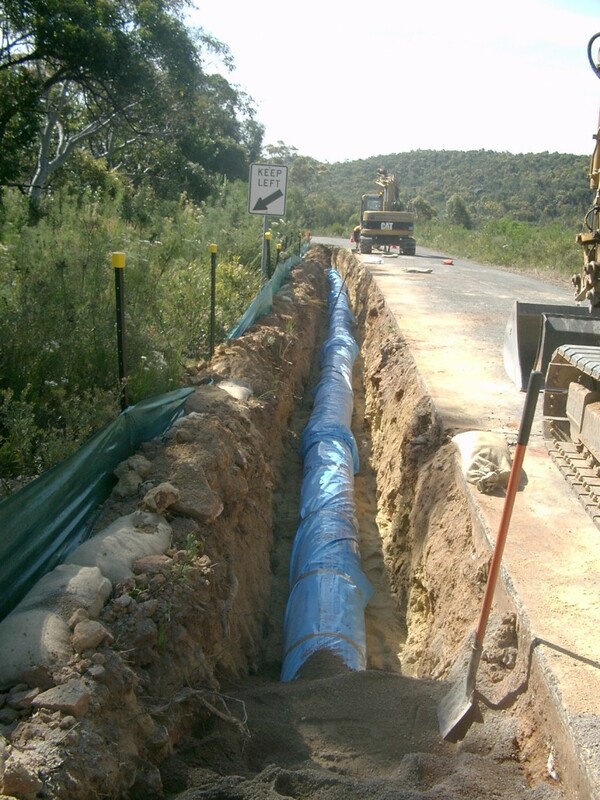 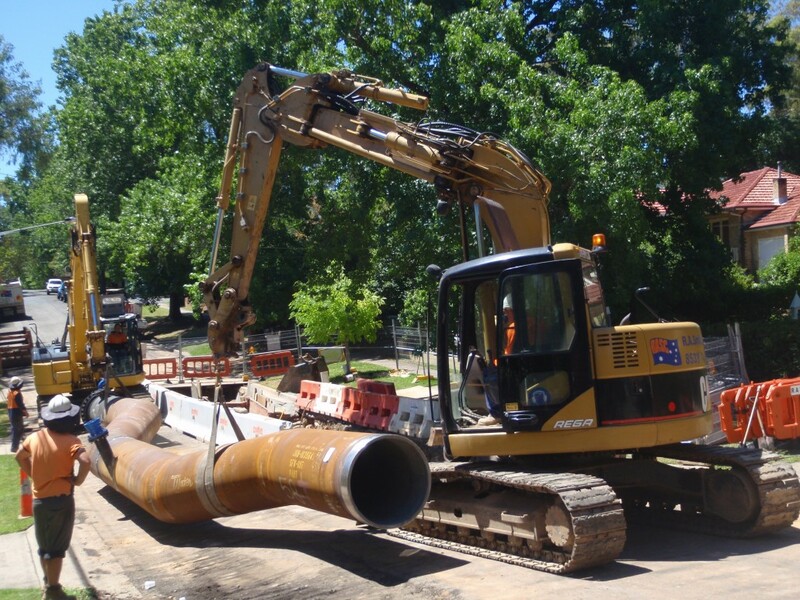 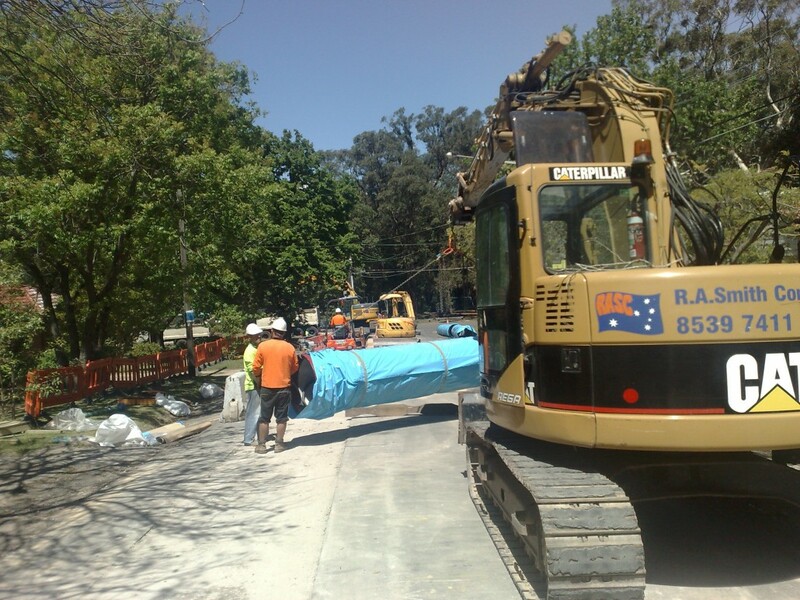 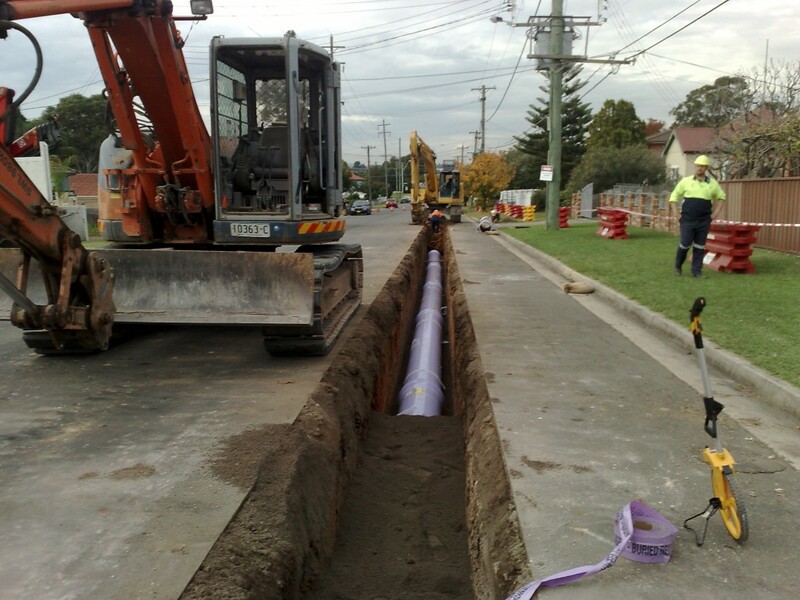 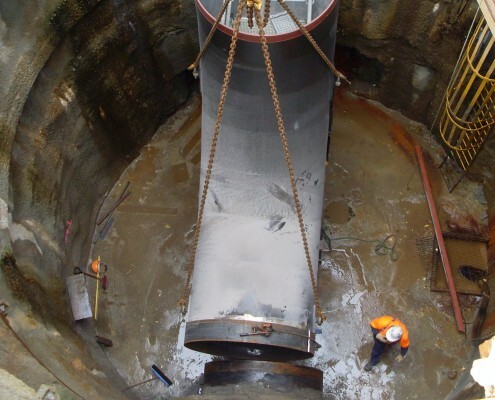 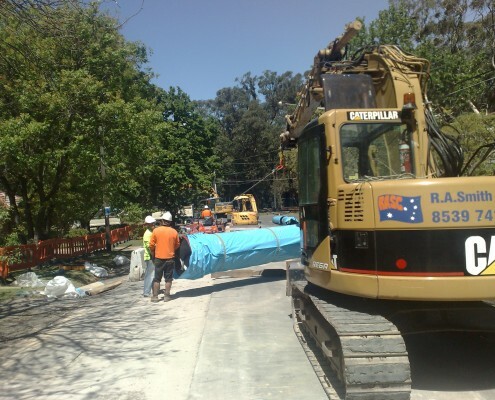 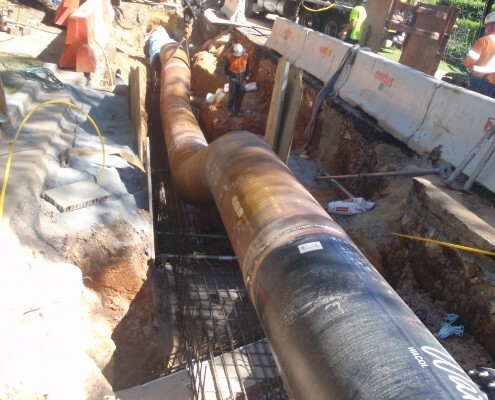 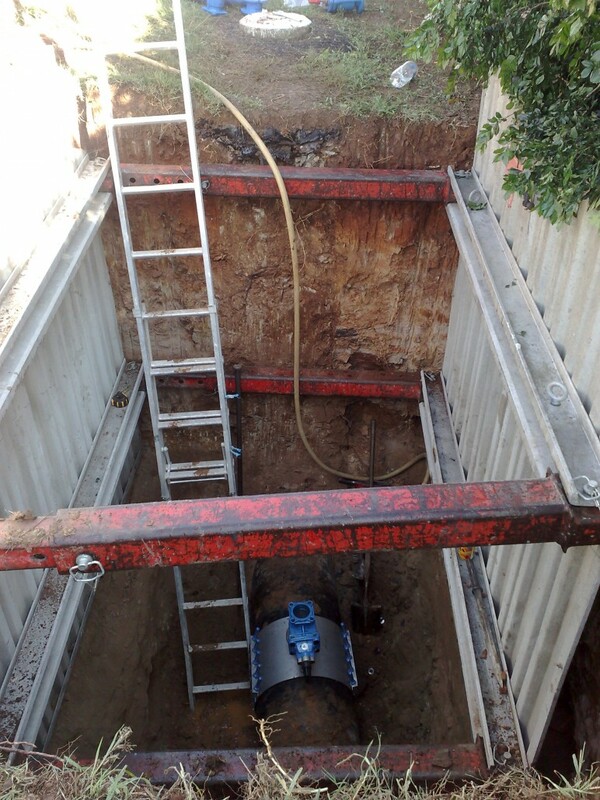 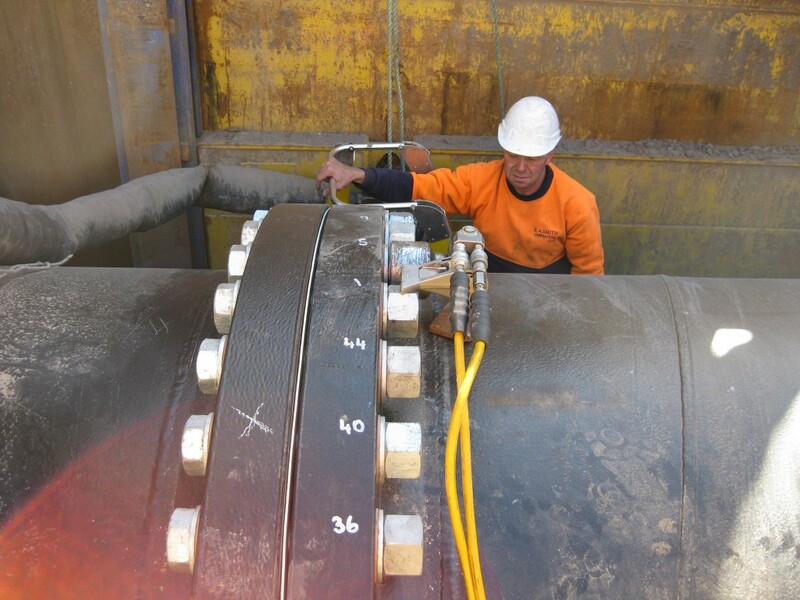 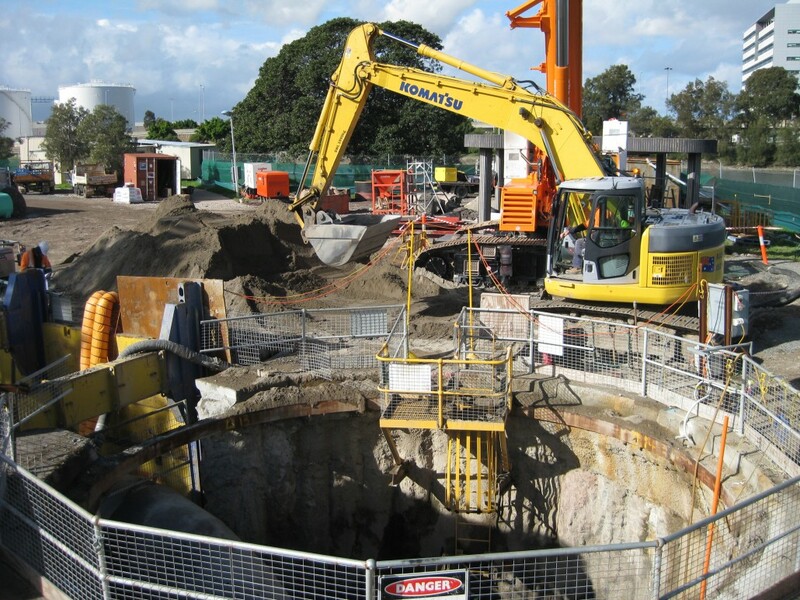 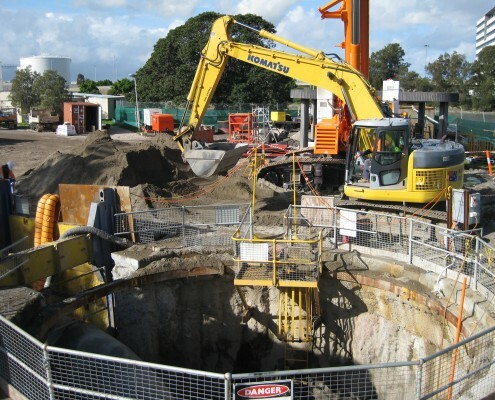 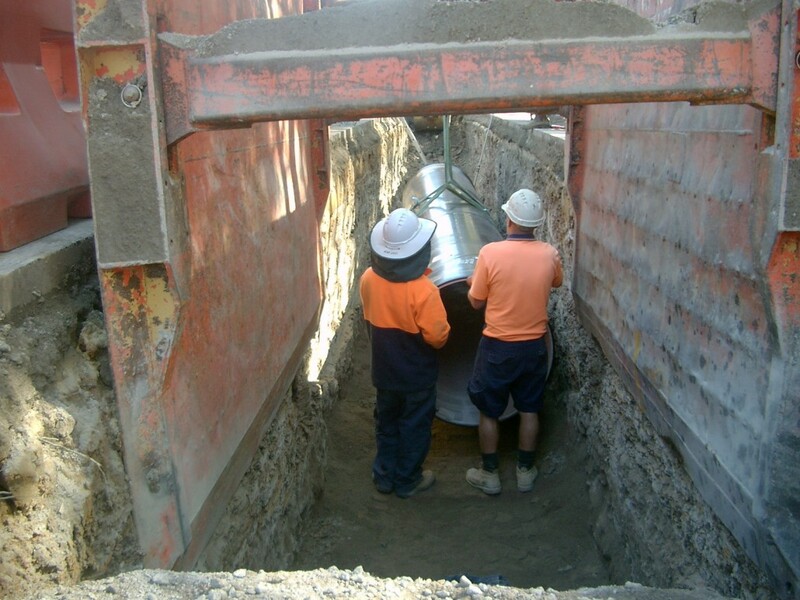 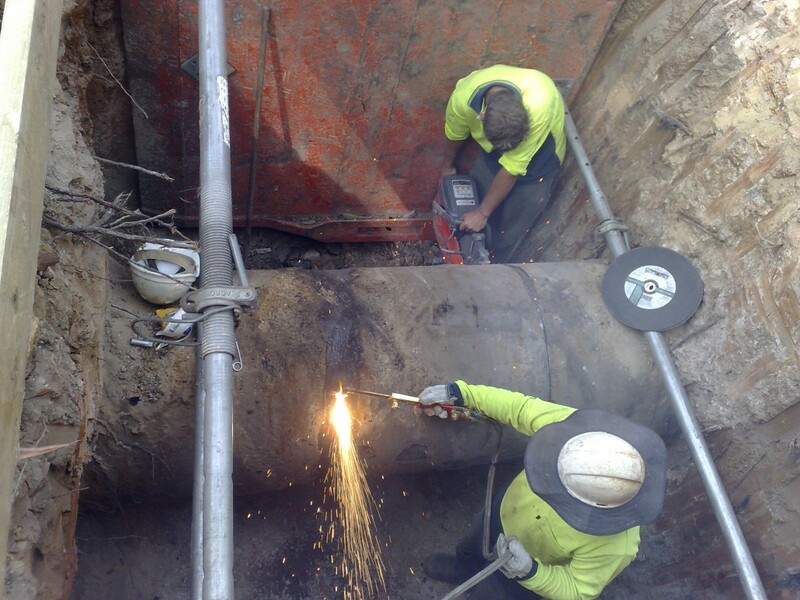 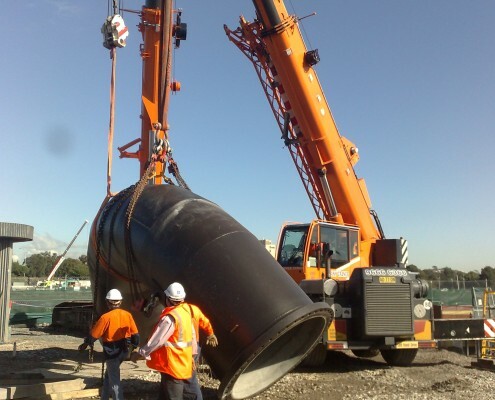 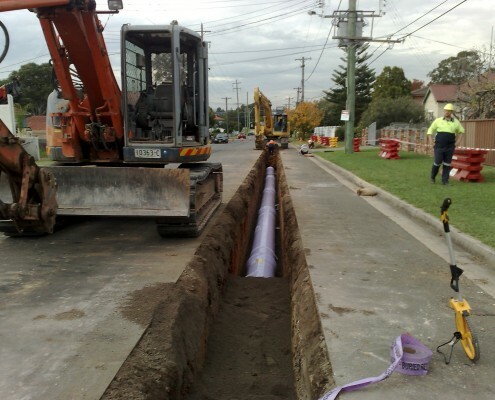 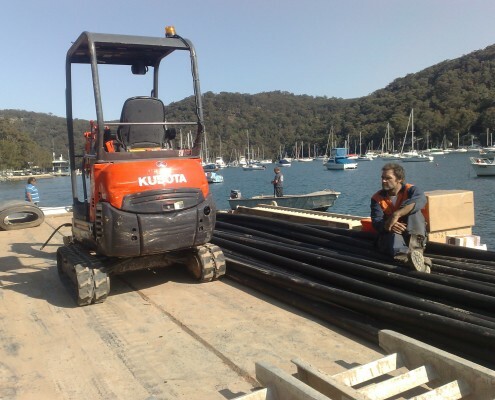 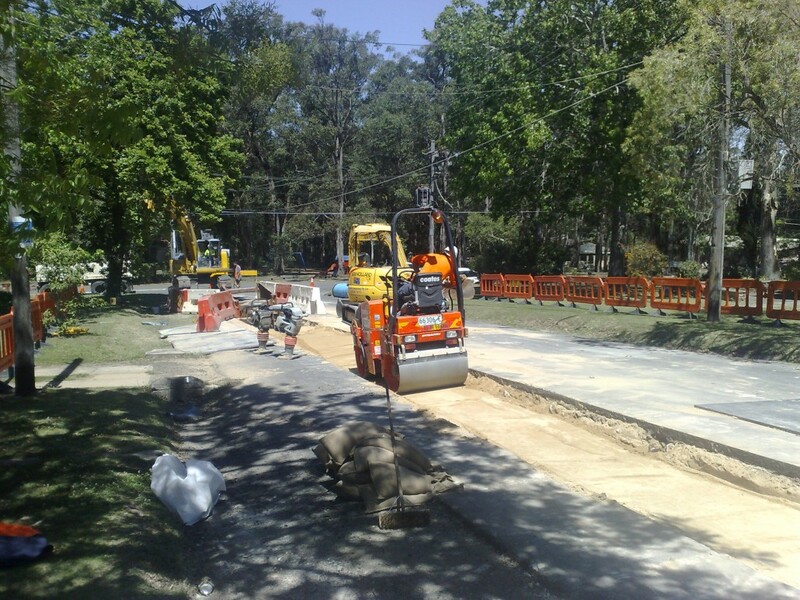 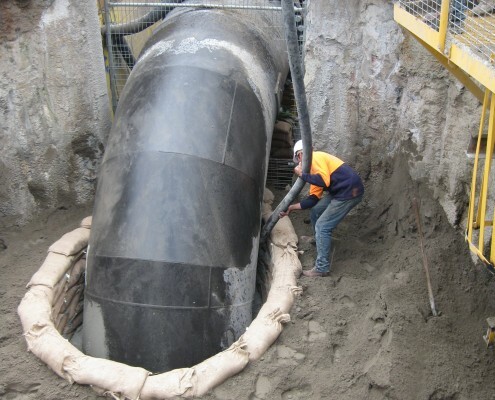 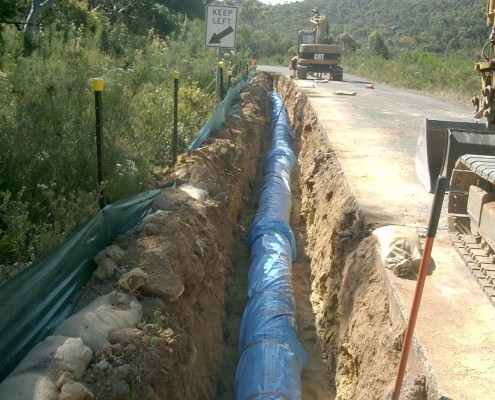 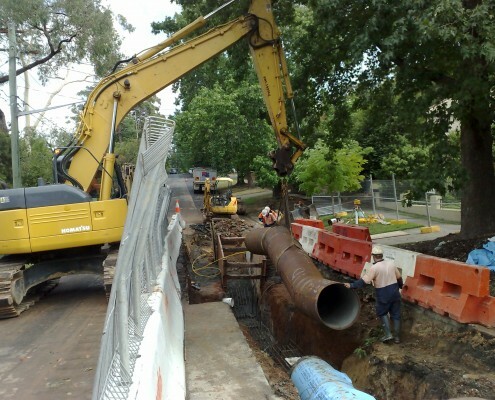 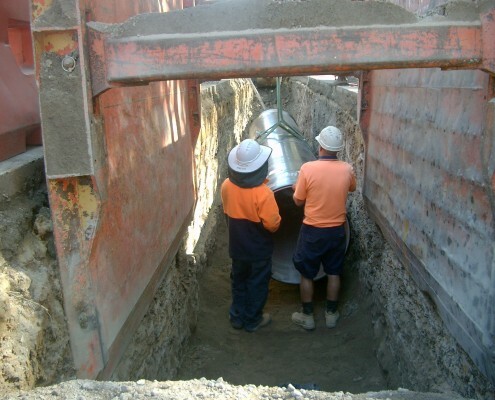 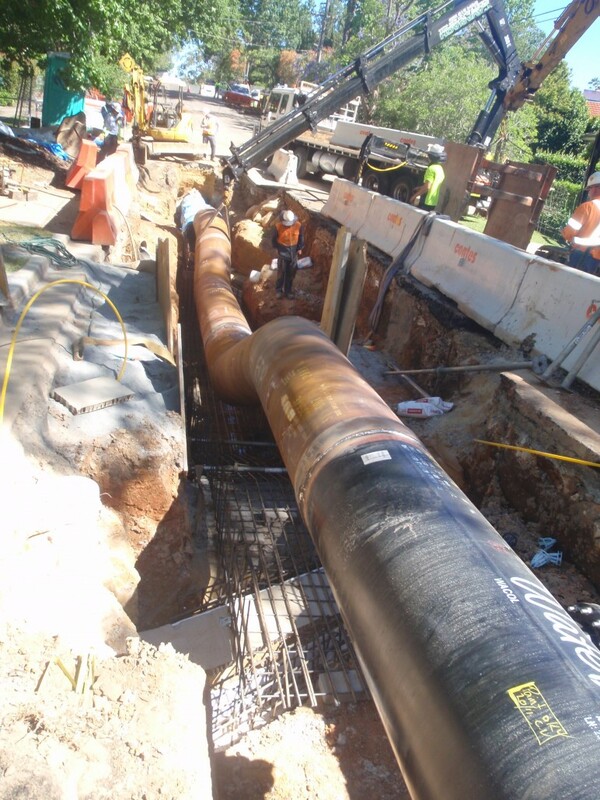 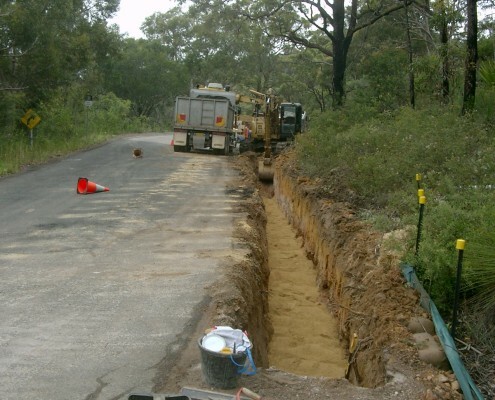 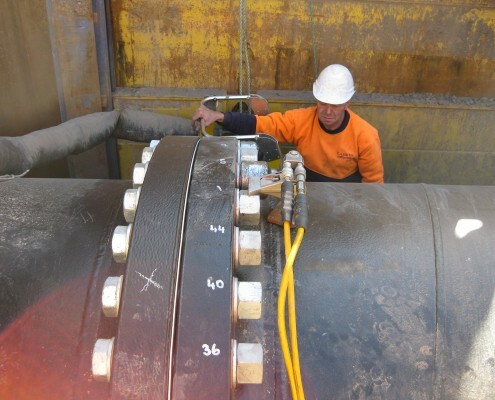 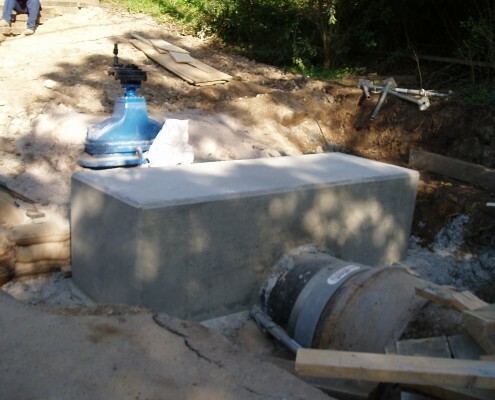 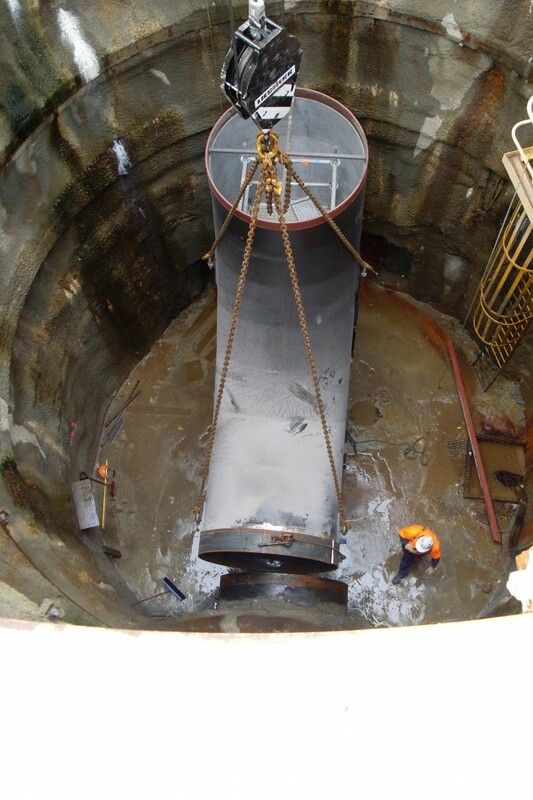 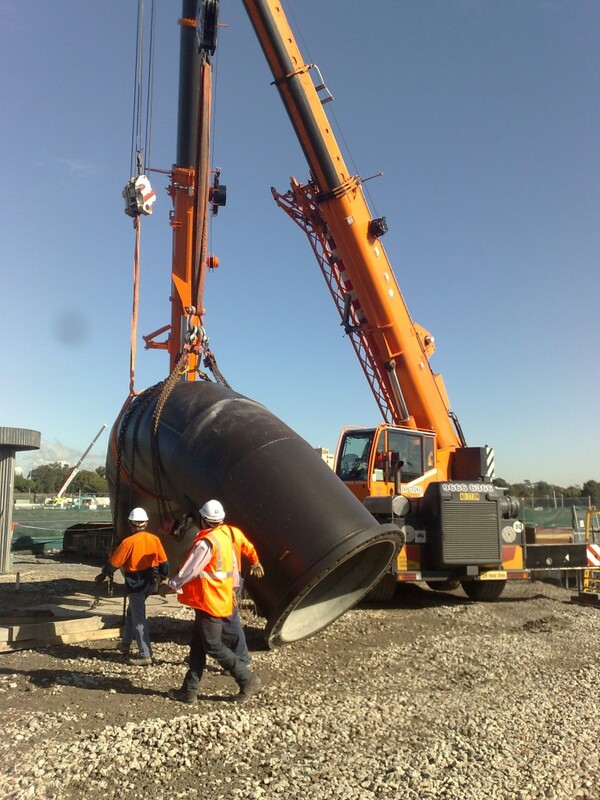 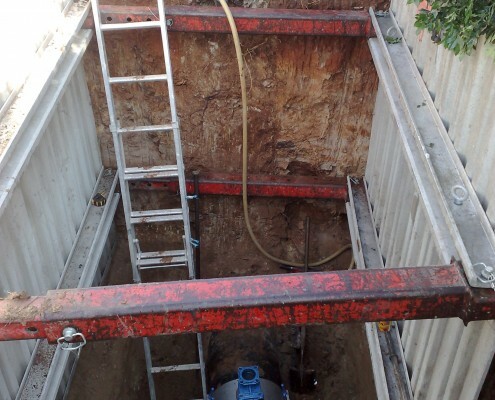 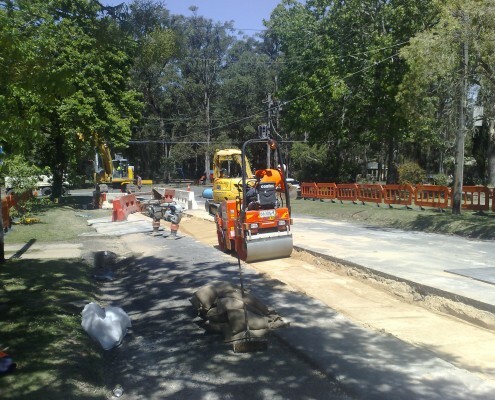 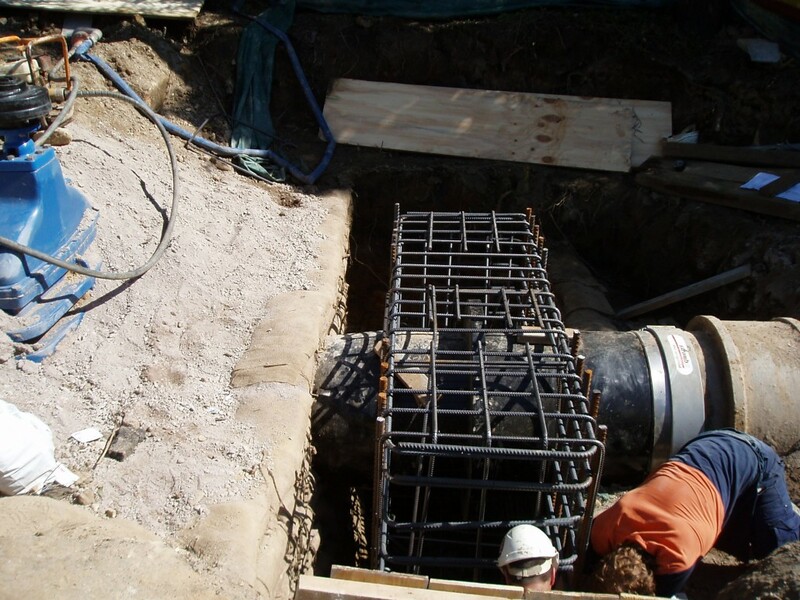 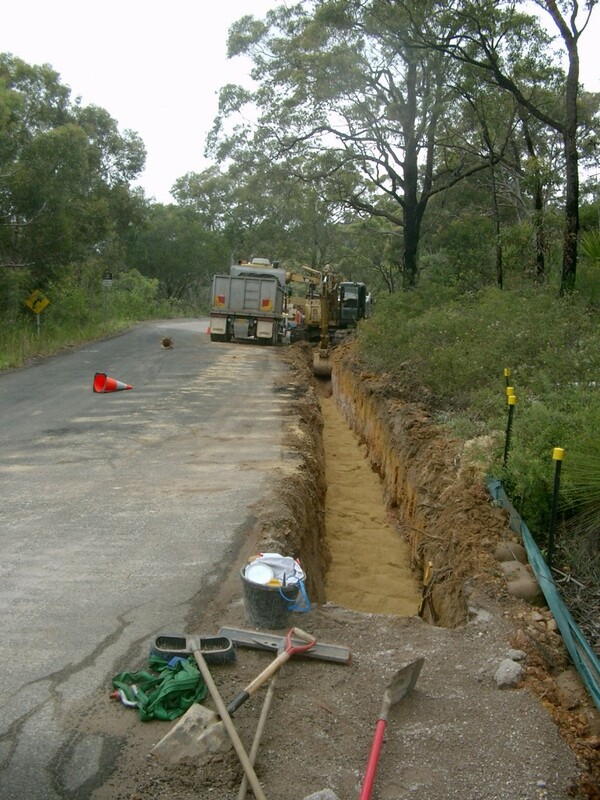 R.A. Smith Contracting are experts in the renewal and extension of trunk watermains and have recently installed mains on the Sydney Water network in built up residential areas as well as on the Helensburgh – Woronora Dam pipeline route through sensitive bushland. 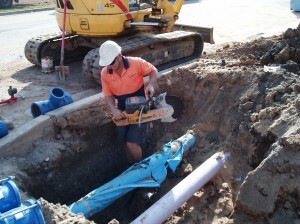 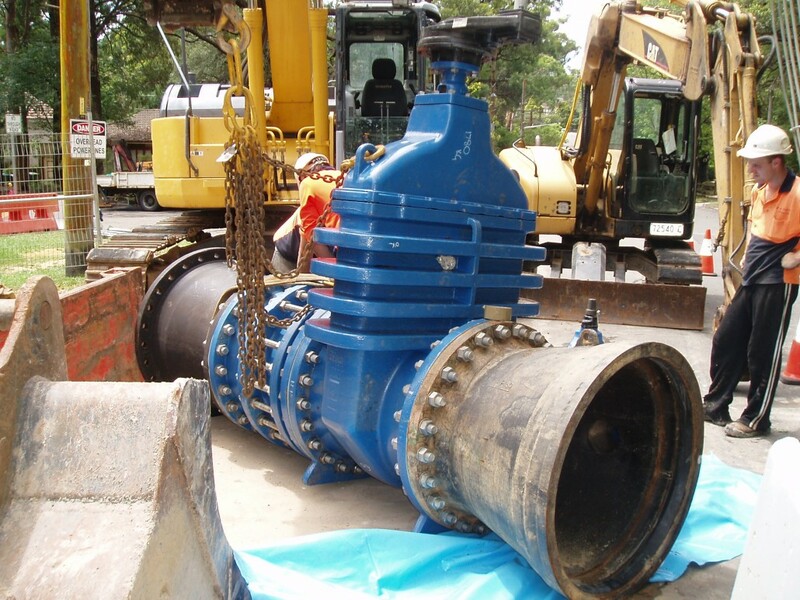 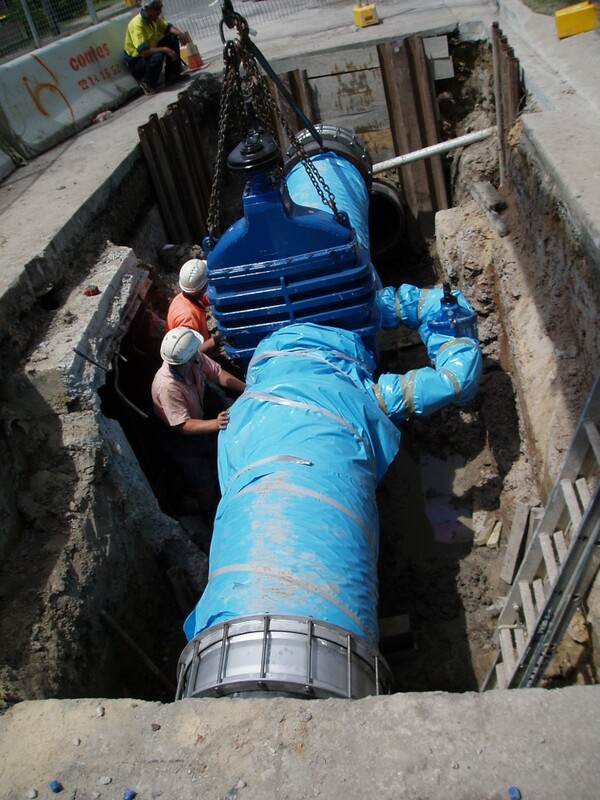 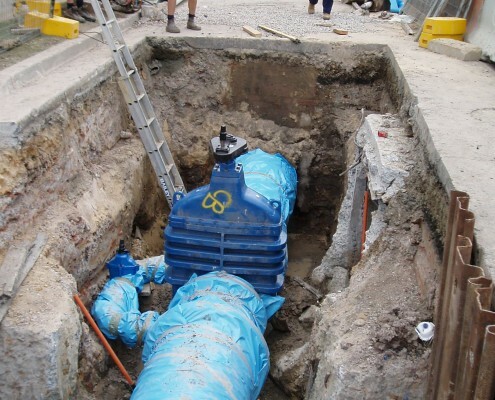 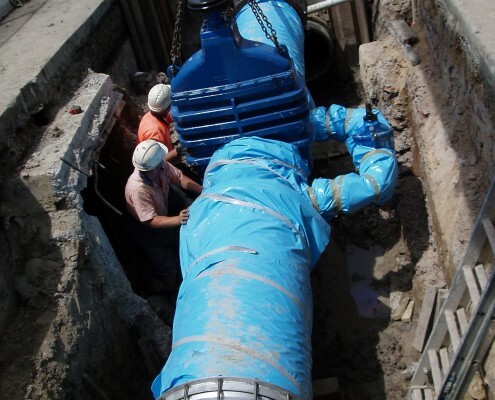 R.A. Smith Contracting are experts in the installation or renewal of in-line valves on large watermains. 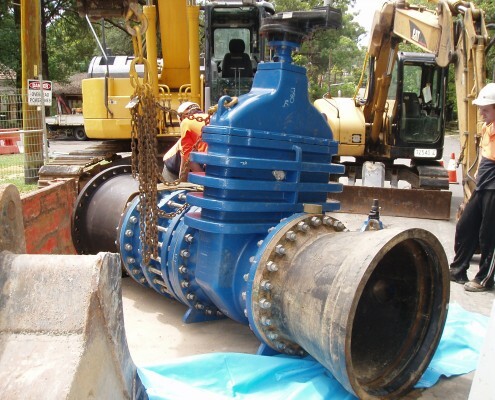 Old and or faulty valves can create a large scale job to remove, replace and anchor to meet today’s engineering standards. Small private mains – 65mm P.E. 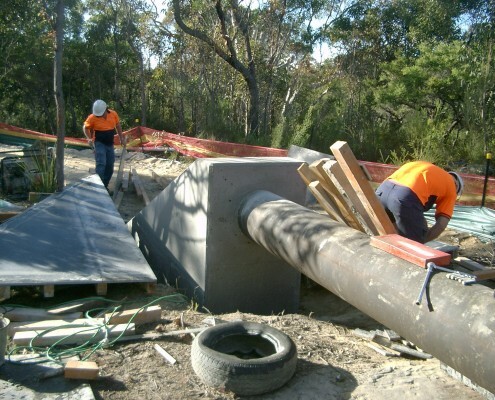 welded fire service installed on Scotland Island in September 2009 for Pittwater Council. 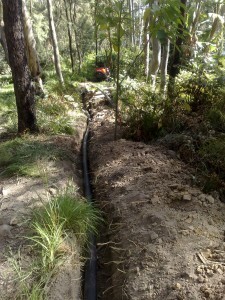 Pipeline provides emergency water supply to RFS for fire fighting on the Island.